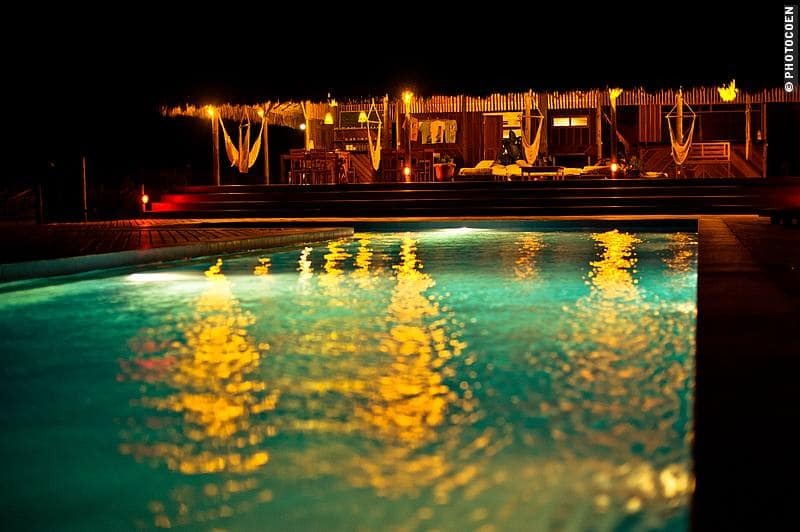 After two days of doing nothing but reading a book and going for a swim in the large swimming pool we say goodbye to the friendly staff of new Pousada Vila Bela Vista in Preá and the German couple Florian and Martina, who will be traveling around the world for the next 6 months. As we are about to leave Carlos, the guard, asks how we plan to drive. “It’s high tide, you can’t drive on the beach now,” he says. We feel stupid. After so many weeks on the beach with its tides we should have known better. “Oh well, we’ll have another cup of coffee then,” I conclude but that isn’t necessary. Carlos explains a 6-kilometers detour over unpaved roads will loop us to another beach. Off we go. It’s a day of passing through fishing villages: hamlets with one-story houses of adobe, mud brick or stone and plastered in some bright color. Men hanging in hammocks dictate the scenery: on verandas in front of houses, but especially under low trees (some decorated with strings of Christmas lights). Women sit together in the doorway, chatting. We get friendly stares, hands up, a big smile. Motorcyclists overtake us and put thumbs up in a greeting. Life may not be the richest here in terms of economic wealth but life seems okay. Tranquility, peace, and joy are written on faces and radiates from the villages. Fishing nets are drying alongside houses. Other villagers make their living with cashew nuts, coconuts or carnaúba palm leaves. The houses with roofs of these leaves always look rustic and neat but that picture comes at a price: carnaúba plantations are incredibly ugly. After the harvest (which was recent) the result is endless stretches of barren trees that look as if they have been ripped apart in a hurricane. They haven’t but their leaves have been cut to make all these roofs (Sandra told me that to cover their restaurant with a new roof they needed 45.000 leaves). We pass an occasional car, motorcycle, cart and horses, and cart and donkeys. 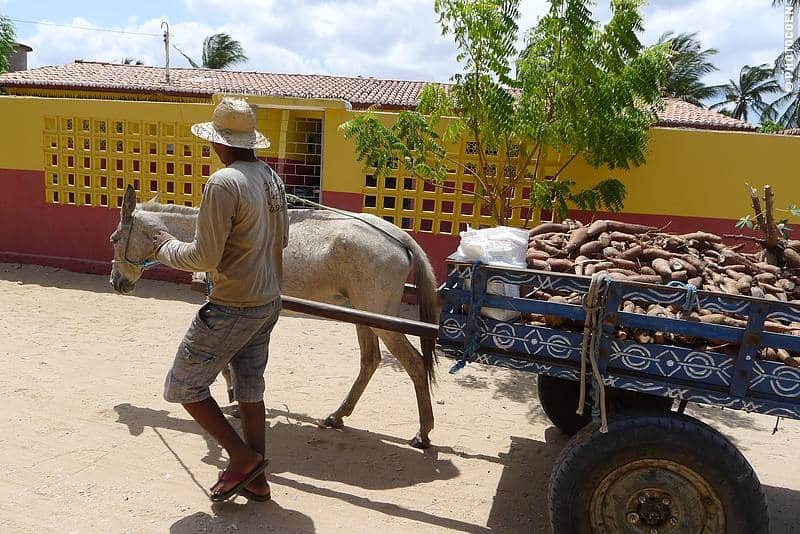 One donkey carries two baskets filled with manioc roots. Fishing boats have been pulled up the beach, the smaller jangadas, which are characterized by the Styrofoam under the bottom of the wooden boat to make them more floatable, always lie on their sides when not being used. In blue lagoons men are fishing, throwing their nets in wide circles. This is a region where traditional jobs reigns and kitesurfing or other forms of tourism haven’t penetrated yet. Before we hit the highway we come across a workshop where we can add air to the tires. Grandpa hangs in a kind of rocking chair, grandson is fixing a (or his) motorcycle, and Dad puts air in the Land Cruiser’s tires. Coen gives him a couple of reais and a postcard and gets the typical answer: the money isn’t that important, the postcard makes him smile. Thumbs up. Great! In Praia da Barra / Ilha da Guajiru we stumble on another kitesurfing paradise. A huge lagoon, or maybe it’s a river mouth, is hemmed in by a beach so there are no waves but has a steady wind. Some twenty kiters are flying back and forth with many jumpers among them. It’s quite a sight. We pick the last restaurant in the row with the least feel of expensive kitesurfing public but locals. We have chosen well: for 20 reais we get a large plate of shrimp that comes with the usual rice, beans, farinha and salad. With a beer we have a splendid meal. We walk along the lagoon, taking in the kitesurfing show, and farther down see men fishing and a couple scraping the mud of the low tide to gather a particular kind of small shellfish. They explain it that they boil them so the shells open and subsequently sell the shellfish for 7 reais per kilo. 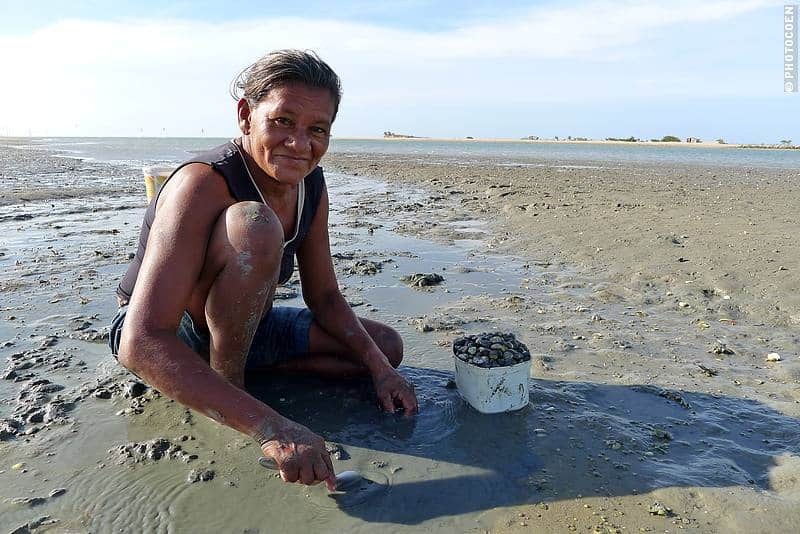 Each day they sit for hours in the mud, scraping to collect their shellfish and have a minimal source of income. A caipirinha at the kite school is a good place to call it a day and, unsurprisingly I guess, we decide to stay another day. 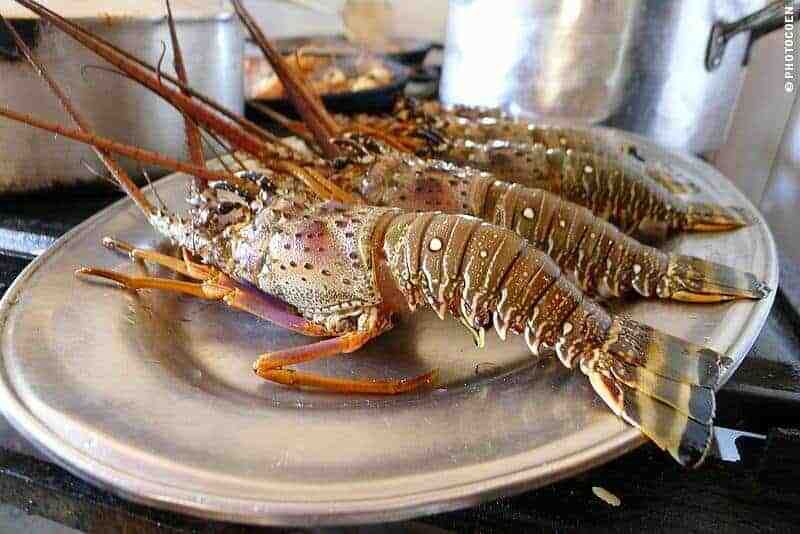 We’ve heard you can eat river lobsters here and simply can’t pass up that opportunity. 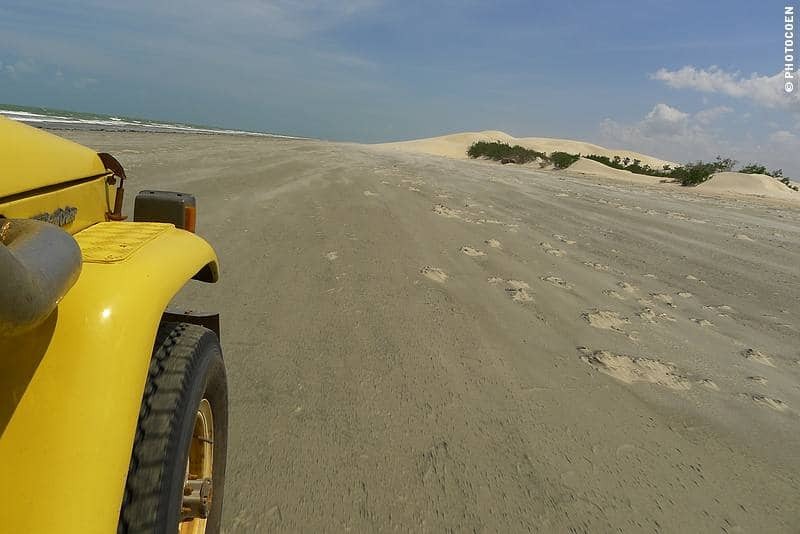 How Do You Get From Dunes to a Guesthouse to a New Website?